T-KING ZB1040JDD6F, T3 Series Light Truck (Diesel Engine) has a luxury instrument desk and an all-dimensional rear view mirror. 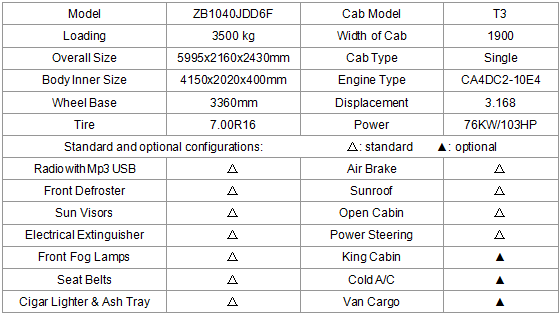 Customers can choose to install a five-door cargo body or install a shock absorber at the front and the rear of it. 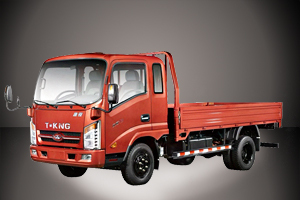 T-KING ZB1040JDD6F, T3 Series Light Truck (Diesel Engine) is comfortable to ride, and has an air brake, a dynamic torque, a 3360mm wheel base, a flexibly-operated dedicated transmission. It also has an air-brake front and rear axle, with a very good braking performance, a high speed and a heavy load.